The very dynamic Grandmaster Chess Tournament in Biel keeps giving us thrills. 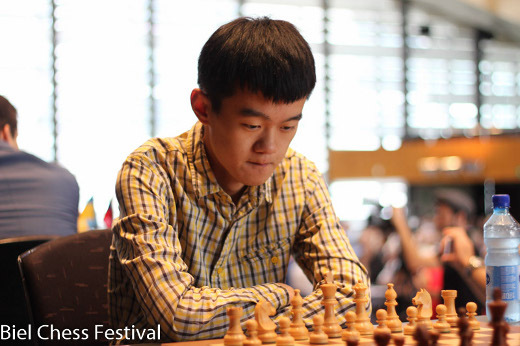 Today’s round saw a change in the lead: Ding Liren took over Etienne Bacrot’s place at the top. The Chinese beat Richard Rapport with black and added three points to his tournament score. The young national champion played very creatively during all the event and is now the favorite to take overall victory. Meanwhile, Ian Nepomniachtchi obtained his first win against Alexander Moiseenko in a Sicilian. The only draw of the day was very interesting as well; Maxime Vachier-Lagrave could not convert his advantage against his compatriot, and early leader, Etienne Bacrot. This is not the first time in the event that Vachier-Lagrave misses a big chance to get a full point. The youngsters’ battle between Richard Rapport and Ding Liren was definitely exciting, as expected. The players played straight-forward fighting chess from the very first move and took the game through a roller-coaster of tactical blows. Although their styles of play share the same desire to get the initiative, their results in this tournament are completely distant – Rapport stands alone at the cellar of the standings. Ding Liren used his main weapon with black, the King’s Indian Defense. Rapport surprised everyone again with his early b3, sacrificing an exchange for black’s dark-squared bishop – his idea was to quickly get an attack on the king. Looking for chances to mate his rival, white sacrificed a big amount of material and was left with a lonely queen against two rooks and two pieces. The fight continued as the white queen had a lot of room to maneuver and, at least, try to give a perpetual. However, Ding defended accurately to finally claim the point after 58 moves. Ian Nepomniachtchi arrived as the second seed but was not able to show good results so far. His first win arrived today with white over Alexander Moiseenko. This loss means a lot for the Ukrainian, who was still in contention for first place after his win yesterday. He is now three points behind the leader with two rounds to go (the Bilbao scoring system is being applied). The players went into the fashionable Rossolimo variation of the Sicilian. When the middlegame struggle finished, Nepomniachtchi was left a pawn up in a very complicated rook endgame. Moiseenko defended accurately for a while but finally faltered on move 62. Fourteen moves later, the players reached a zugzwang position where black cannot stop his rival from queening one of this two passers 1-0. The French players had to battle against each other today. Maxime Vachier-Lagrave did not hesitate at using his main weapon with black, the Gruenfeld Defense. Etienne Bacrot had to defend stubbornly for the second day in a row and, once again, managed to get the half point (one point, given the scoring system).